Have you ever been in a crisis? How did you respond? 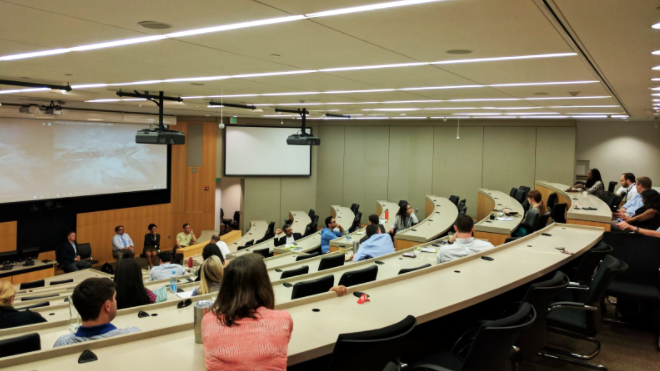 Our Weekend Executive MBA ’18 cohort has self-organized a few speaker panels throughout the program to afford fellow classmates an opportunity to share their real-life experiences and promote peer-to-peer learning. Recently, four of my classmates each decided to share the unique story of a crisis they faced and how they managed it. 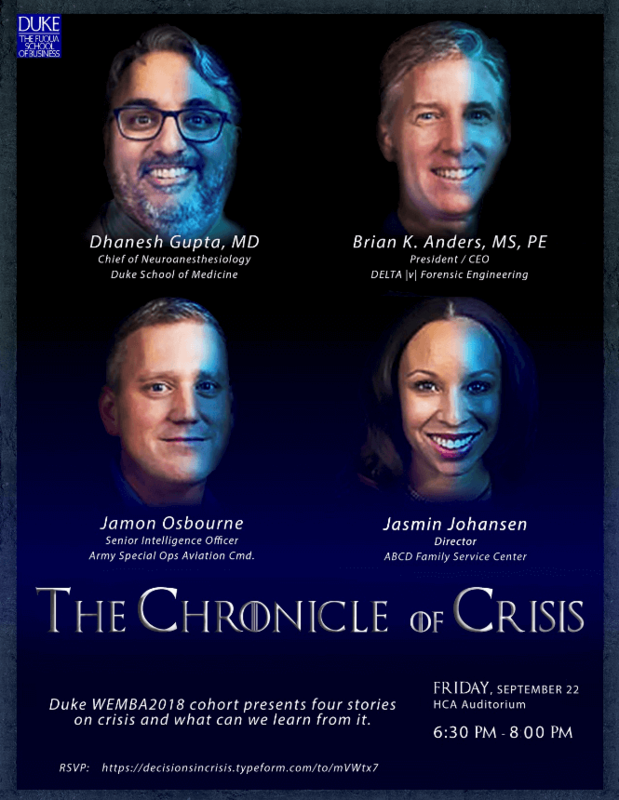 Upon seeing the “Chronicles of Crisis” promotional event poster, what MBA student wouldn’t be intrigued? I certainly was. This particular panel was organized by my teammate during Terms 1 and 2, Munindra Nath. Upon attending the panel, I was blown away by the situations my classmates have faced and overcome. Here is my summary of the panel and an overview of the themes that emerged. Brian Anders opened the panel discussion by sharing a short vignette about a time when the plane he was flying had ice on its wings and an engine that was no longer running. For most, this moment would be terrifying and might end in disaster. For Brian, this moment was challenging but did not rattle him the way some of the challenges he faced when starting his own business did. Brian’s advice to the room was to remember three words in a moment of crisis: “Aviate, Navigate, and Communicate.” This simple mental model, widely used in the field of aviation, was a reminder to always keep things moving, figure out where you are going, and let others know what to expect. We all have different triggers and if we are honest with others about our situation and need for help, we are more likely to get through the crisis relatively unscathed. Everyone has a different perspective on what obstacles they consider to be dire and everyone needs support in these moments. Reiterating the importance of advanced preparation, Jasmin Johansen shared an acronym (CRAPE) that her team uses to quickly remember the appropriate steps to take while responding to crisis. CRAPE stands for: Calm; Relationships; Affirming feelings, Planning it out; Exercising feedback and follow-up. Jasmin works with people who are sometimes at the lowest points in their life—she coordinates community and social services for families in need. 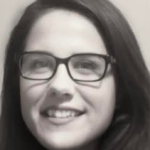 In this role, Jasmin often makes personal connections to the people she supports and cares deeply about their well-being. Jasmin reminded the audience, that in any crises, whether it’s professional or personal, we often have an emotional barrier up that prevents us thinking or acting logically. CRAPE helps Jasmin think through required action steps and get through many hard situations. Another piece of advice that resonated from Jasmin’s story was that the little things matter. Throughout her experience, she’s noticed that even the smallest gestures, like offering a smile or a warm hello to another person while they are in crisis, can help de-escalate the situation. This was a valuable tip on how you can support others and exude a sense of calm that is contagious. “Every day is like a crisis in the operating room,” Dhanesh Gupta remarked halfway through sharing his story about a particularly troubling situation with a patient whose condition was declining rapidly. Dhanesh’s story underscored that we must stay calm to get through any calamity. Although it’s easy to panic, one must have the capacity to inhale, exhale, and think. Dhanesh echoed many of the other panelists reminding the audience that preparation is key, as is self-awareness. He said it’s easy when you’re scared or exhausted to react aggressively as tensions rise, but you should be aware of that and know how to mitigate that behavior before it occurs. The reality is, we live in a stressful world. We all face constant pressures to improve performance and productivity. If we can create trust within our firms and institutions to make everyone feel safe, then when we are faced with crisis, we will be better positioned to respond. This sentiment seemed to be shared by everyone in the room and was a testament to the student’s belief in teamwork and the collaborative Team Fuqua spirit. As a Special Operations intelligence professional in the U.S. Army, Jamon Osborne has faced many crises throughout his career. One day after a particularly enjoyable morning bike ride followed by a hot shower, the crisis event warning went off within his unit. Jamon immediately responded and moved to the pre-determined mission briefing location. When he arrived, he was informed that there was a unique crisis event and his unit needed to respond immediately. Never mind that he wasn’t fully dressed. There was no time to delay and Jamon knew he had to relay orders, prepare for movement, and mobilize his team. Not everyone will be fortunate enough to have a deliberate signal to warn them before the next crisis hits. We can, however, learn best practices from the response planning techniques the military utilizes. Jamon’s story serves to remind us that if we are conditioned to know what steps to take and actively plan for crisis events, we will be able to act immediately and won’t feel so overwhelmed by the issue at hand—even if it is a crisis of great magnitude.